Below are some examples of block, script, and something in between block and script. Our letter styles are not always specifically block or script. 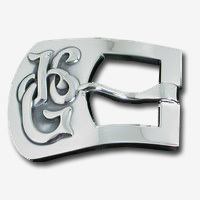 Often the initials and their order determine the style of lettering. As you can see in the photos above, sometimes it is the serif on the end of each letter that determines whether it is considered block or script. View the pricing sheet. Requires Adobe Acrobat. 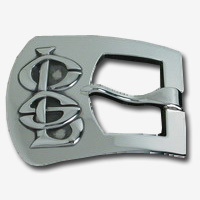 If you are ordering a buckle you'll need to select the style of the buckle base. And if ordering keeper and tip accessories, the style of keeper and tip. 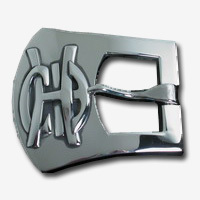 You may order any style of keeper and tip to accompany a buckle. Please make sure you indicate whether you are ordering all sterling, 18K and sterling, or solid 18K. Production lead time will be quoted at the time the order is placed. Because all of our items are handmade we appreciate receiving orders as early as possible before the date it is needed. For example, if you know you want to receive an item for a Christmas delivery, placing your order in the Spring or Summer is highly encouraged. Typically and excluding the holiday season, you can expect a 4 - 6 week turnaround. Keep in mind however, if we have to re-submit artwork for approval it may add to the lead time. Gift Cards are available if production lead time exceeds the date needed in hand. There are times we can include the design of initials on the Gift Card. Please let us know if you would like to give a Gift Card. To begin production we require a 50% deposit with the remaining balance due upon completion. Your deposit is your commitment to begin the design process and is non-refundable; however we will work with you until you are satisfied with your design. Acceptable forms of payment are Visa/MasterCard/American Express/Discover or check (made payable to Lolly Harrison). We can email or fax an invoice to you, and will notify you once your deposit is received. Sometimes it is helpful for you to let us know if you have a strong opinion about something you've seen. If you do not have an opinion, then it is recommended that you select "Artist's Discretion" in the style of initials area of the order form. After many years this has proven the most efficient way to proceed. If desired, you will have the opportunity to see and review your design prior to production. Revisions will be made if necessary. Please note, additional revisions can add to the lead time. If you are more comfortable visiting by phone about your design please call us at (512) 476-0180. Once we have completed a rough sketch of your initials, we can send it to you via email or fax for your feedback and/or approval.